In this Hearthstone Journey to Un’Goro budget deck tech, I take a look at a cheap Midrange Hunter build that I used to climb to Rank 4 on the NA server with a 23-12 record from Rank 7. That’s right, thanks to numerous good commons Hunter received in Journey to Un’Goro, you can build a perfectly viable deck for mere 1260 dust – no adventures, no epics, no legendaries, just cheap stuff that wins games. There are only five rare cards: two copies each of Golakka Crawler and Knife Juggler, and one Eaglehorn Bow. Everything else is either common or from the Basic set. The overall cost of the deck, if you have to craft each and every common card too, is 1260 dust. Journey to Un’Goro really made such a cheap Hunter deck possible. Hunter overall became viable again as some of the fiercest competition, namely Shaman, lost early-game power, enabling Hunter to better challenge the board. However, it was specific cards from the new expansion that made a cheap budget version of the deck possible. 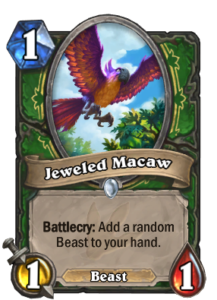 While Jeweled Macaw is only a 1/1 body for 1 mana, it is really important for Hunter: as the class lacks card draw, the resource generation from Jeweled Macaw is important to refuel. It works alright as a turn one play, but it is even better later in the game as an enabler for Kill Command, Nesting Roc, or Houndmaster, or just as additional resource generator when you’re about to run out of cards. 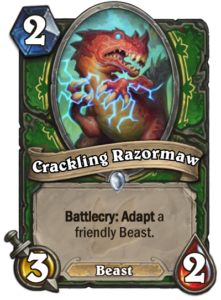 It’s amazing that Crackling Razormaw is a common card. A solid 3/2 Beast for 2 mana that adapts another Beast you control, it is a powerhouse. While the requirement to have a Beast on the board to use the battlecry can sometimes be tough, it also enables the battlecry to have an immediate effect when played on a minion that is ready to attack, unlike minions that adapt themselves: windfury, poisonous, there are some really good powers available from adapt for immediate use. Five mana. 4/7 body. Beast tag. Taunt. That is a good combination, and even though the taunt requires other minions to activate, Nesting Roc is a very powerful card, and yet another common at that. Perhaps the best one-drop in the game right now, or a pseudo-two-drop that creates two 1/2 minions for two mana, Fire Fly earns a spot in the list despite being an Elemental and not a Beast. 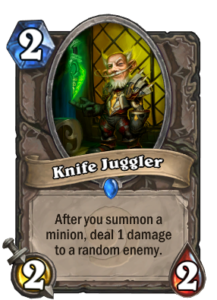 Sure, it does not synergize with some of the cards in the list such as Crackling Razormaw and Scavenging Hyena, but it is still good with Knife Juggler, Nesting Roc, and Dire Wolf Alpha. Most of all, with the traditional Hunter powerhouse deathrattle minions being more expensive, Fire Fly is needed to cost-effectively fill in the gaps. 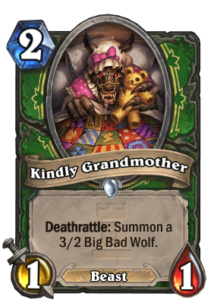 Sure, it would be great to have Kindly Grandmothers and Rat Packs, but the Grandmother is from Karazhan adventure and Rat Pack is an epic, so some compromises need to be made. 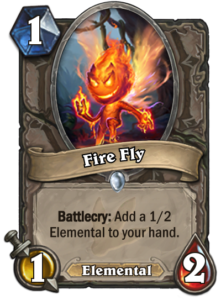 Instead of simply putting in weaker alternatives, Fire Fly is one of the cards that takes the deck to a different direction and enables power not by being a weaker version of a deathrattle-heavy Hunter, but by executing a slightly different gameplan. Win condition – how does the deck win games? 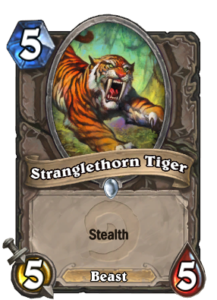 This build is fairly aggressive: you want to start by controlling the board and then gradually move towards pushing more damage, with the option to eventually let go of the board and finish the game with the Hunter Hero Power, Kill Commands, or Stranglethorn Tigers who can survive even on a lost board thanks to their stealth – Adapting a Stranglethorn Tiger with Crackling Razormaw or buffing it up with a Houndmaster can be a great way to find a finisher! Overall, this is the fairly classic midrange strategy from board control to face damage. You really need to get on the board right away when playing this deck. You do not have the sticky deathrattles to challenge an existing board, so you need to work for it fair and square. There are six one-drops to help you get there, two copies of each Alleycat, Fire Fly, and Jeweled Macaw. 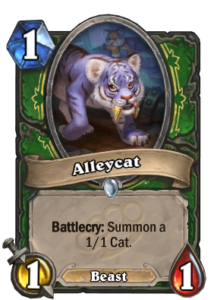 There is also considerable swing turn potential with the numerous tokens the deck is able to generate from Alleycat and Fire Fly, as well as Unleash the Hounds, combined with either Knife Juggler, Dire Wolf Alpha, or Scavenging Hyena. The tokens also help establish board presence with Nesting Roc: for 6-7 mana you can have a 4/7 Taunt starting from an empty board with Alleycat (6 mana) or Fire Fly (7 mana, use the token too). 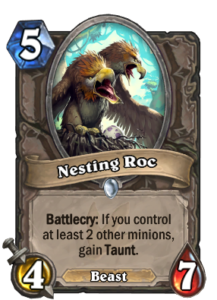 It is important to note that Nesting Roc gains nothing but taunt from having other minions on the board: in many matchups the taunt is irrelevant so you can happily drop it on the board as a 4/7 just for the stats. 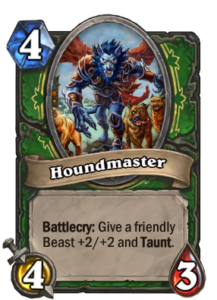 Another card that can benefit from the numerous cheap tokens is Houndmaster: a huge power play that brings 6/5 worth of stats on the board for 4 mana, all it needs is a beast for a target, and this deck provides them in abundance. 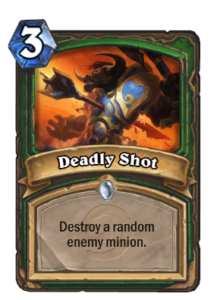 Finally, the deck also includes one copy of Deadly Shot for clearing out a big threat or roadblock. If you have the Deadly Shot in hand, it can sometimes be a good idea to focus even more on keeping the opponent’s board clear so that you can ensure a hit on a possible big target. Just don’t overdo it, killing the opponent is fine, after all! If you want to further improve the list, you need to look into some more expensive cards. There are at least five potential improvements available. Kindly Grandmother is the biggest improvement you can make. A super-solid two-drop that sees play in both aggressive and slow variants, it is a Hunter staple that adds a ton of board presence to the early game. 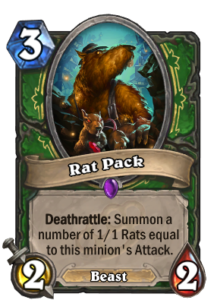 Rat Pack is another sticky deathrattle minion you can add to the deck. 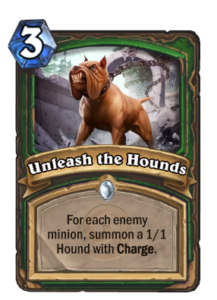 Coming down at three, it almost mandates removal, as otherwise there is the threat of a big Houndmaster play on four. 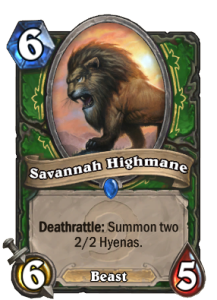 Savannah Highmane is often called the real Hunter legendary, although one that you can run two copies of because it is only a rare. It can complement a deathrattle-based sticky board strategy, but did not make the cut in the original list, because the other deathrattle cards were not available and it is not that great when isolated. 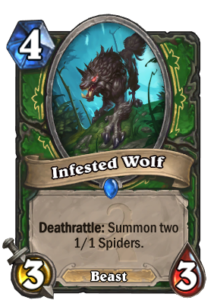 Infested Wolf is the fourth Hunter deathrattle minion. Generally the weakest of the four, it can nonetheless also see play in the right mix and meta. 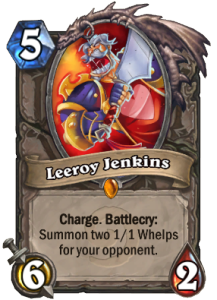 Leeroy Jenkins is an option if you go for the more aggressive route. It can top out your curve an give you a good finisher, better than the Stranglethorn Tiger in many cases. From these options you can either build a slower, more deathrattle-focused deck, or a faster deck that tops out at Leeroy Jenkins. Regardless of the way you go, Kindly Grandmother and Rat Pack are the first improvements as they are used in practically all variants that are not pure face decks. 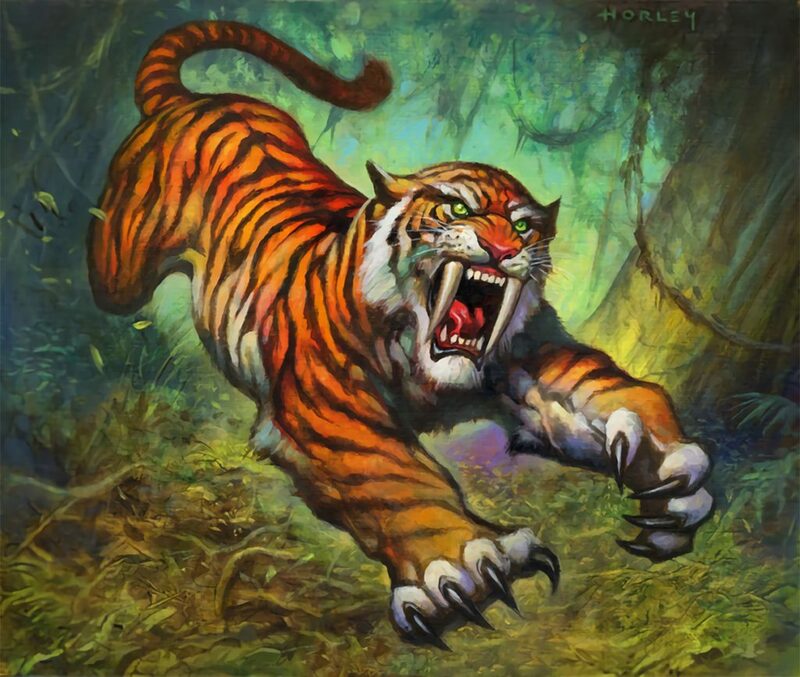 There are several cards that can make room for these improvements: Dire Wolf Alpha, Knife Juggler, Stranglethorn Tiger, Golakka Crawler, Fire Fly, and even Nesting Roc can all be replaced in the right circumstances. As this list is relatively fast, comes with two Golakka Crawlers, and has some taunts go alongside them, it is a reasonable deck to take to a fight against Pirate Warrior. It is also very good against Quest Rogue, and can pummel Mages and Priests to the ground effectively. What it lacks compared to more deathrattle-focused Midrange Hunter builds is the ability to keep the board no matter what, yet it is not a Face Hunter either. 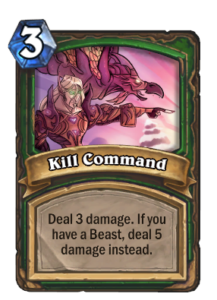 This means that other Hunter decks are favored against it, and it also struggles against Elemental Shaman. Aggro Druid is also closer to even than with other Hunter lists, which are favored in that matchup. Overall though, it is a solid performer, especially for its cost, and a completely viable option to take to rank 5 for that golden epic season reward even in the now slightly more settled meta.